I don’t know how to sew casual clothes – the kind of knock around frocks you wear on the weekend – but I’m going to learn. – Avoid the discount department store look? – Address excessive ease in loose-fitting patterns? – Achieve a finished appearance despite a lack of construction details? – What is Eileen Fisher’s secret? 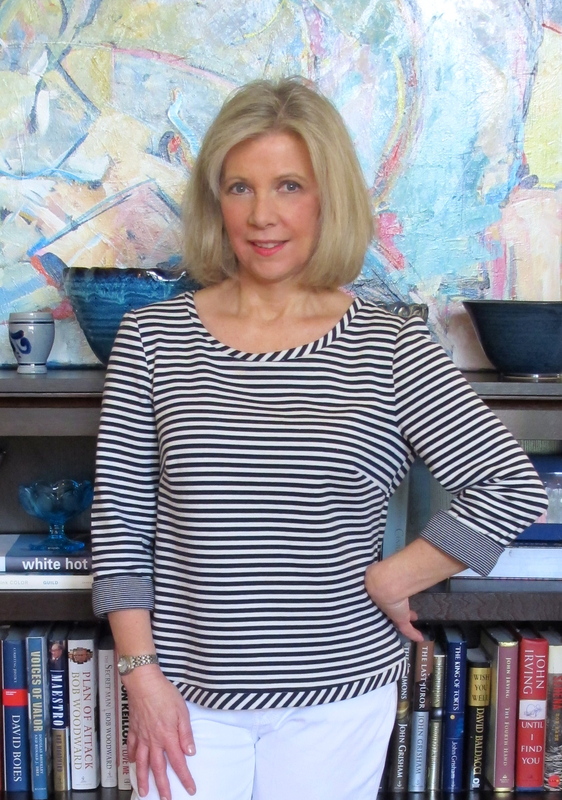 I gave myself the assignment to sew a very casual top – one I would wear on a spring morning while sipping coffee on the porch at the beach. 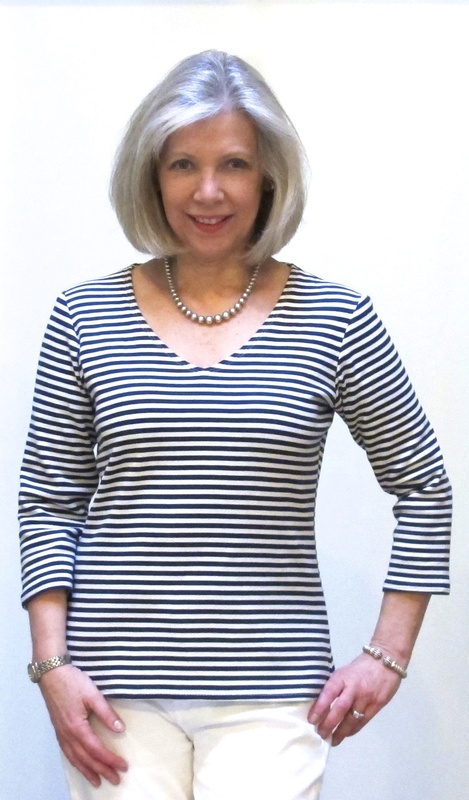 As a devoted fan of blue and white everything, I ordered this double-faced navy and white nautical stripe cotton-blend jersey from Mood Fabrics. The fabric is beachy and the price is right. 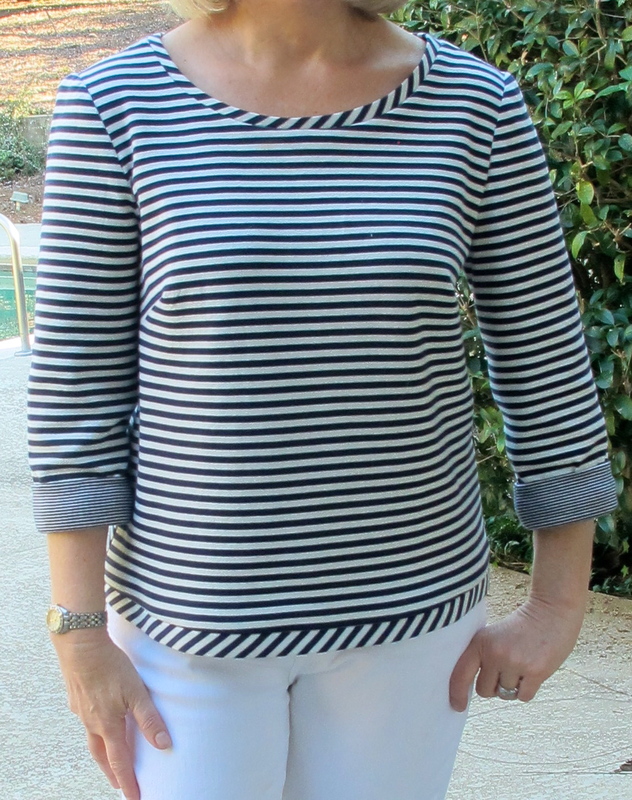 I can make a top for under $15.00. 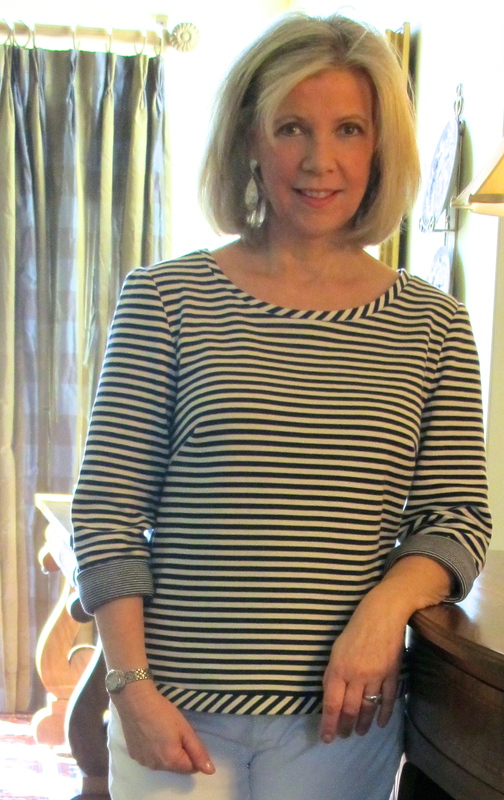 And is it possible to get more casual than this McCall’s pattern? 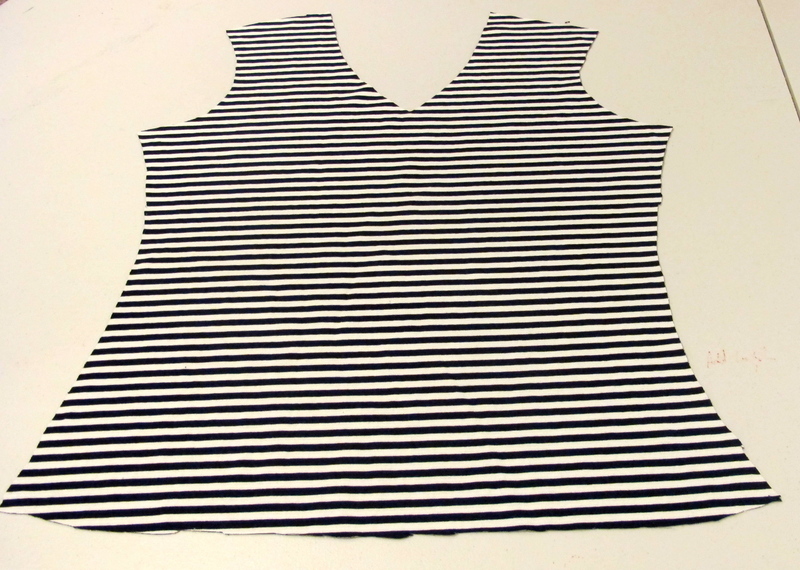 I liked several things about the pattern description such as a semi-fitted garment, optional vertical darts, and a pattern designed for knits and wovens. All that was left to do was fit the garment and add my personal touch, which came in the form of a mistake. 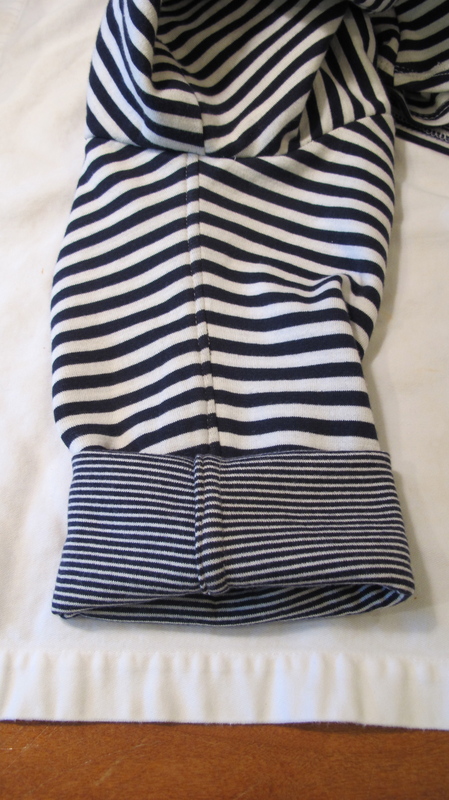 The fabric was too thick to fold over the double-layered neck facing forcing me to finish the seam with the serger and leave the bias facing exposed. Adding the bottom bias band seemed like an obvious next step. I guess I passed the assignment, and I like the added touches, but I’m not completely happy. 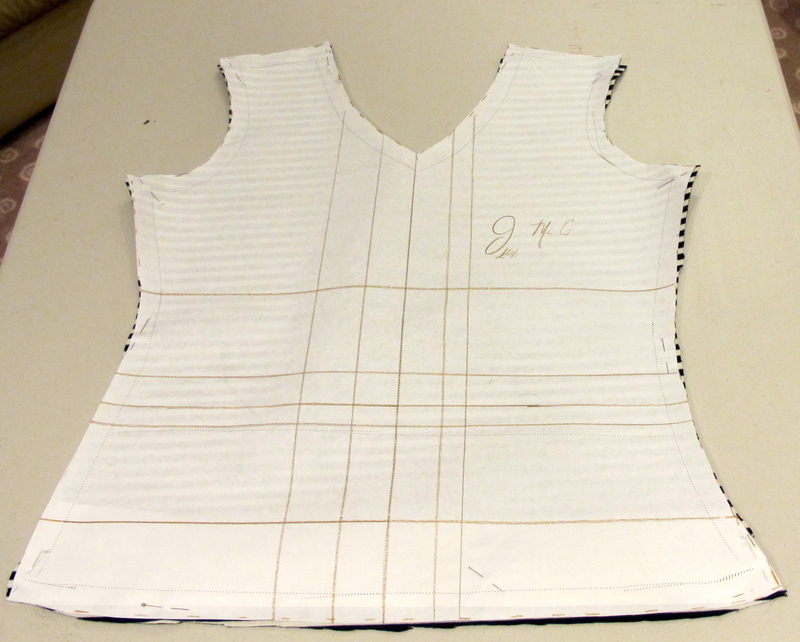 I opted out of sewing the vertical darts due to the weight of the fabric, but look at the line drawing – very shapely without the darts if you ask me. I didn’t believe they were necessary. This top is just too boxy. I’m not much for pity parties and I had fabric left over, so guess what? 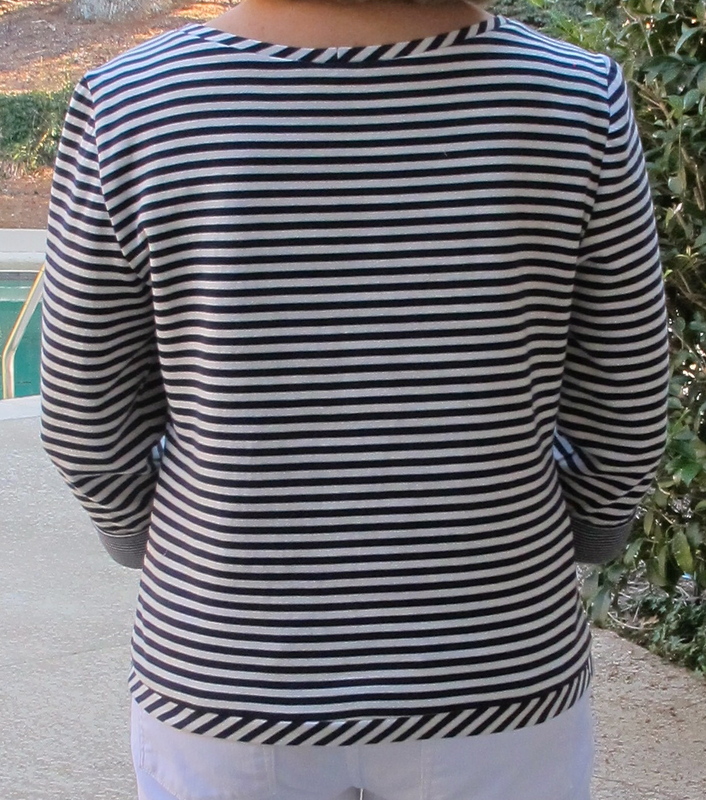 Kenneth King’s Clone Your Favorite Garment class to the rescue! 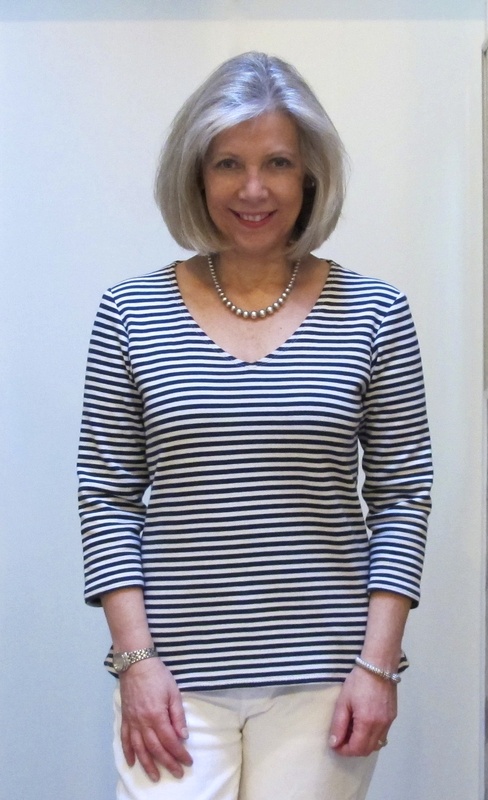 I cloned a favorite , two year old, J McLaughlin top and now I have just what I want. 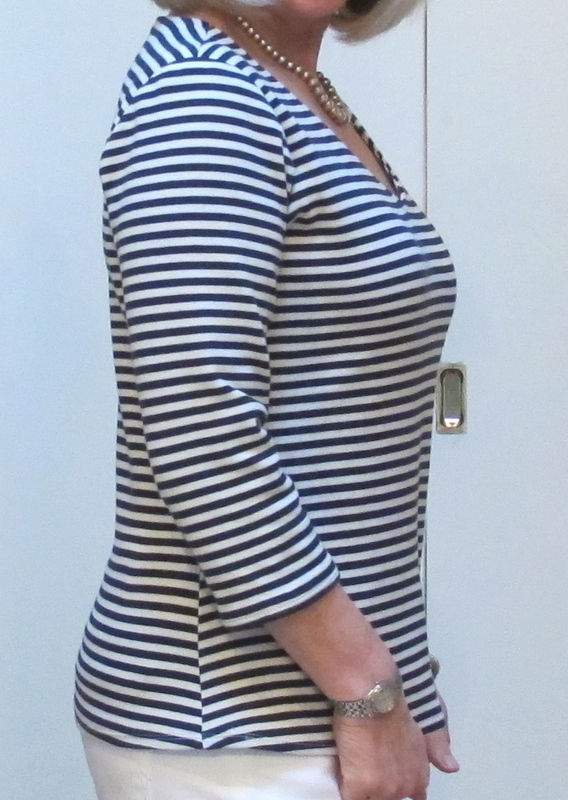 The front fabric piece reveals the curves that give it simple, attractive shape. There are no darts and the top is well proportioned. 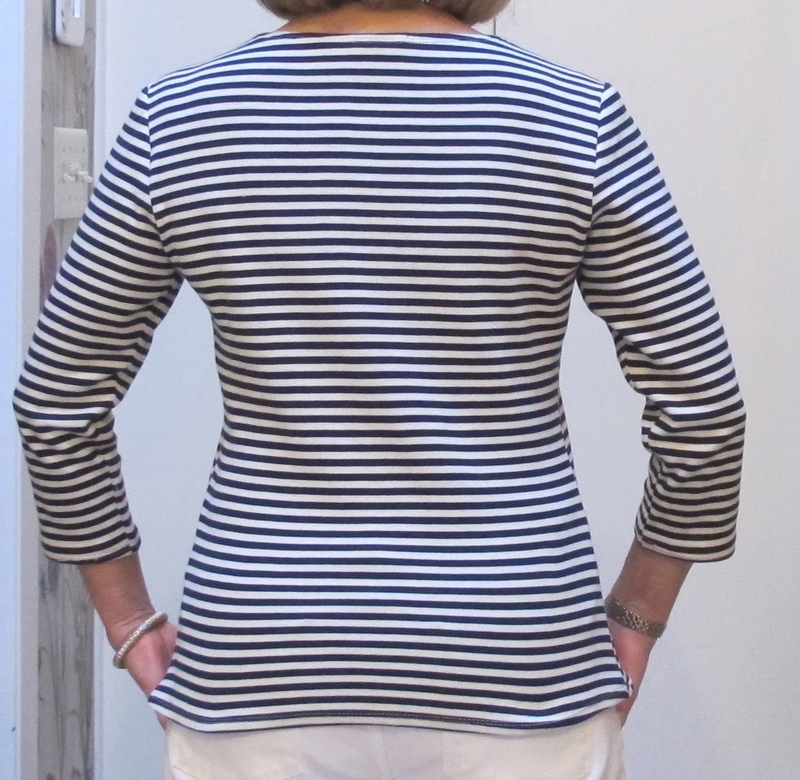 This second time around I sewed French seams in the sleeves allowing me to neatly roll the sleeves and show the contrasting band. As I mentioned before (blogged here), Kenneth King’s course is quite enlightening! No measuring is involved whatsoever, the use of materials is very efficient and it unlocks designers’ secrets to coveted clothes. I’ll never understand why the search for simplicity is often so complex – but I suppose it’s worth contemplating one of these days while sitting on the porch at the beach drinking coffee – perhaps wearing one of these tops.